Last weekend we had the opportunity to witness history at the NMRA World Finals in Bowling Green, KY. Our pals over at SCT got their hands on a showroom fresh 2015 Mustang, and aside from the cars Ford brought out for their display, it was the only S550 on the property. The car was so new that SCT had just picked it up prior to arriving at the event. In a very special, and history making moment, the S550 made its way down the quarter-mile for the very first time at a NMRA event. As far as we know, this is the only documented quarter-mile pass of a stock S550 to date. The car is an automatic version, no word from SCT on which ring and pinion option was chosen for the car from the factory. Regardless, SCT was able to lay down a 12.86 at 107 MPH. That’s not too shabby for a stock automatic equipped car. We suspect the manual transmission versions out of the factory may be a little faster, and this lines up with the performance we’ve seen out of many stock automatic equipped S197 Mustangs with a 5.0. SCT hit the road after the NMRA event and put the car on their in-house Dynojet chassis dyno. 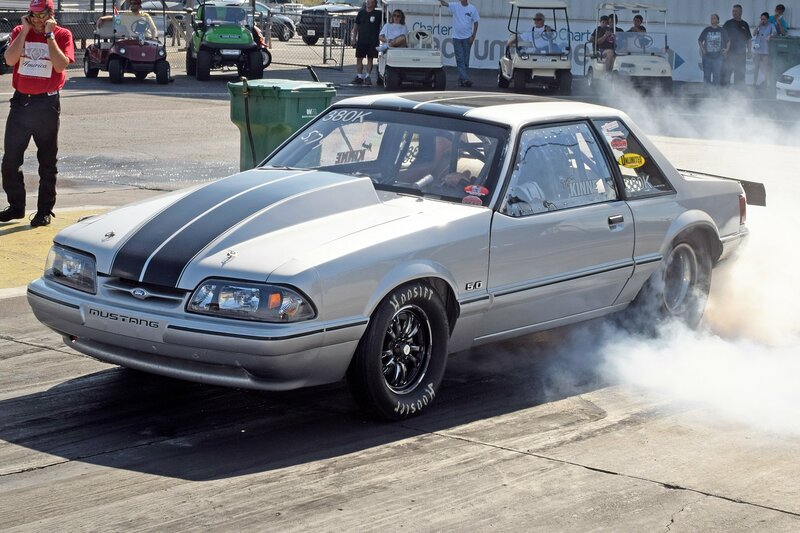 There it made 361.85rwhp, 345.39 ft-lbs on a fourth-gear pull, and 339.43rwhp 353.02 on a fifth gear pull. SCT says that they were having issues hitting the speed limiter on the dyno, something they’ll obviously remedy quickly. So now we know what a stock 2015 Mustang GT will do at the track, and on the dyno. Ford has sown us some examples of what these cars will do when modified as well. The questions is, what kinds of times will these cars be running by the end of winter, after the tuners and parts manufacturers have had their hands on them for several months? We’ll keep you posted.